BBT nv // Blog » Improve the handling of your stock front axle beetle a lot! 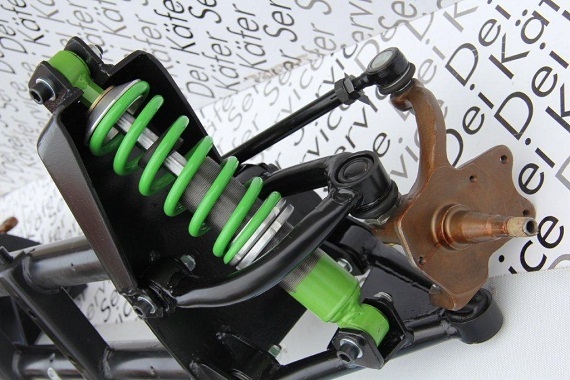 Improve the handling of your stock front axle beetle a lot! BBT’s premium Italian distributor DEI Käfer service launched their latest product. They convert a stock front axle into a real wishbone suspension! they start from a new front axle and sell as a bolt-on application! a real work of art! all complete, all new! Available in pre 64 and 65 on conversion. Worldwide distribution available through BBT but plse take some lead time into consideration! for more info or prices plse contact your favourite BBT sales guy or BBT distributor in your neighborhood. Is dit een setje met goca attest zodat we het op onze daily kunnen gebruiken? helaas nog niet, worden ook niet in belgië maar wel in Italië gemaakt, fabrikant is wel bzig met een TUV keuringsattest. Salve ,e’ bellissimo .io ho un bug del 06/1967 e’ possibile montarlo e quanto costa ? ci sono delle modifiche importanto da fare? Around what Price would these be? Ride height compared to a stock beetle? Ride height is equal as original, price we will send by email to You. we can make a little higher, but not really a lot…. I will email you and put You in direct touch with manufacturer, so communication will go way faster. is it narrowed any and how much. The front axles is not narrowed, this type of front axle is only made to improve handling, not to lower the car…. Will This fit my 69 and how much to ship it the San Antonio Tx. reply will follow by email Adrian. could you tell me the cost of this double A arm front suspension system?…and if it’s available in a “kit” form. What is the price of this suspension system? Can fit in a 57 oval bug? Last, can be send to Portugal? What the price for this system? Can fit in 57 Oval Bug? Complete reply will come by email Pedro! Can you send me detail and price, deliver to thailand. Last, can be send to Thailand? Thanks for your inquiry, we will give You full details by Email…. I would also like to know more info on the beetle front end and the price. I am interested in this front end conversion for my Kelmark GT. Please send lead times, options, product costs, and shipping costs. hello I am interested in your a arm suspension kits, cost and particulars? 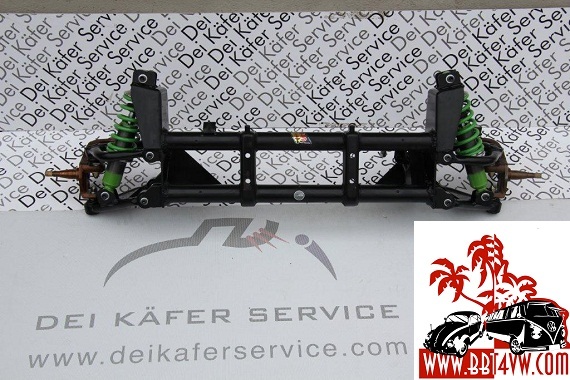 I want to know more about Dei Kafer Service wishbone suspension! Thank you for this simple design ..but I am asking is this design comfortable . yes for sure, its comfy… but especially designed for better road handling, You can almost compare with a modern cars suspension..